Thailand has some of the most exotic foods in the world. The tom yam kung and the_ kaeng khiao wan kai_ are frequent favorites of visitors to this special place. Tom yam kung is basically a very spicy shrimp soup and the kaeng khiao wan kai is a green chicken curry. The food from this region generally can fit into four taste categories: salty, sour, sweet, and spicy. Thailand is also home to unique fruits such as mangosteens, pomelos, rose apples, and rambutans. 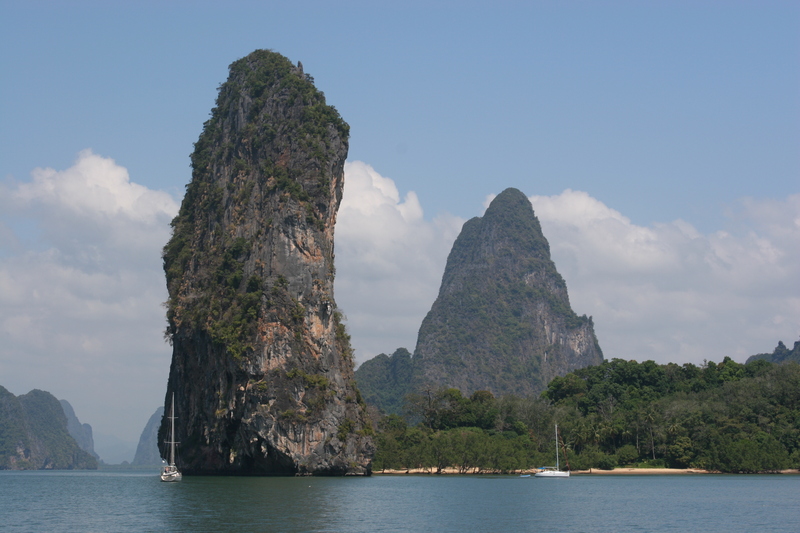 One place you must visit in Thailand is Railay Beach. Rated high among tourist destinations, this stunning beach leaves quite an impression. Surrounded by white sand and gorgeous blue water, Railay Beach is the ultimate relaxation spot. In addition to the amazing sandy beach and crystal-clear water, Railay Beach is also home to caves and cliffs, one of which houses a secret lagoon. Stay in one of the many hotels on Railay Beach or rent a luxury beach house for a more private visit. If by chance you are not a free-spirited beachgoer, then the famous Calypso Ladyboy Cabaret of Bangkok is sure to delight you. Full of breathtaking sets and costumes, coupled with thrilling musical acts, this show is definitely worth checking out. The locals who live in Thailand are typically very friendly people. Most will greet you with a smile, which illustrate the catchphrase of this beautiful place: land of smiles. It is said that Thai people do not like confrontation and smile to release social tension. Whatever the true reason, be prepared to find yourself surrounded by smiling, happy natives, and remember to return the gesture and smile back. Kind at heart, Thai people are also very generous and like to give to others. Whatever you reason for visiting Thailand, for business or pleasure, you will never forget your experience in this majestic land. There is beauty everywhere you turn. From the picturesque scenery and delicious food to the warm-hearted locals, this charming country has to power to both surprise and humble you. You will be amazed at the sights and sounds that will unfold around you.